NEW! 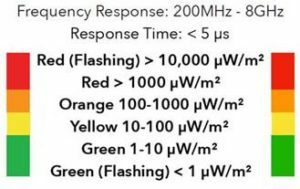 Small but accurate RF meter lets you discreetly measure microwave radiation anywhere you go! - Indoor Environmental Testing Inc. Check your house for hot spots, detect cell towers, wireless routers, bluetooth devices, smart meter emissions, baby monitors, airport radar, microwave oven leakage and more! This is a very exciting product designed and engineered in Canada by the Engineers of Safe Living Technologies. Circuit boards made in Silicon Valley USA. The “Safe and Sound RF Detector” (200 MHz – 8 GHz) is very impressive for the price, a great value! It uses all of the latest detection technology and provides a quick and simple assessment of the Radio Frequencies present in your environment and requires no technical experience. The Safe and Sound also has a sound signature analysis mode which helps identify which RF Sources you are being exposed to. It is the most accurate detector in its price range ($159), has been lab tested and has a true linear response in the entire frequency range (especially above 3 GHz) which sets it apart from all other meters. Its measurements levels are in accordance with Building Biology Guidelines SBM-2015 and backed with a 2 year Warranty. Nowadays with smart meters, cell phone towers, wiress routers and wireless gadgets everywhere, it’s hard to keep track of how much exposure you’re getting. Great to check your house for hot spots, to relocate strong emitting appliances, when traveling for checking out guest rooms, hotel rooms, airplane seating, restaurants, and even campsites as more and more sites now have wi-fi and cell phone towers! 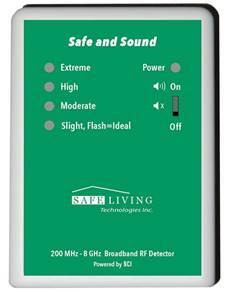 To order the SAFE & SOUND PREMIUM RF METER call 608.241.9883 or 1.800.692.4783. If we are busy with another client, leave your contact info and shipping address and we will call you back for your payment info. This small pocket size meter is accurate and gives the same information and readings as meters more than twice the price! !